Obligations, have-tos, to-dos, endless tasks mounded here and there in front of us until the end of time. Or so it often appears. Why look up and out when only these nagging things are there to confront us? Why look about when more might present themselves and insist on being addressed? Well, serendipitous things can happen if you look up and look about and you can miss them if you are mired in the mundane. I had two quite serendipitous experiences last week and I am still smiling in remembering each. Dreary and rainy days, both. Bleh. Walking out the back door from work at the end of one day with a colleague, we were met by the beautiful sight of a perfect and complete rainbow. The north side ending picturesquely behind trees decked out in their finest fall colors and the other blocked by the industrial building behind ours. 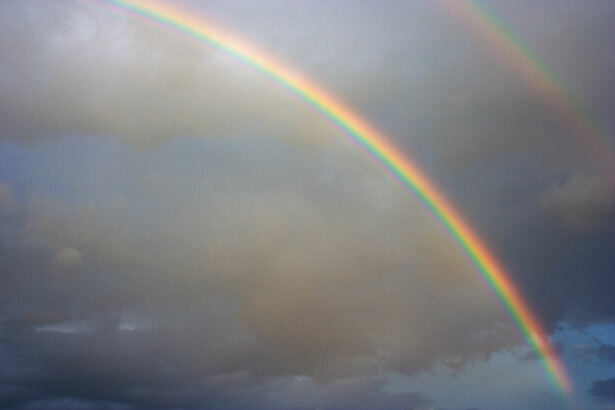 The entire arc completely visible, which is even more rare than a rainbow itself and therefore to be savored. My mom always took particular delight in rainbows, so I couldn’t help but think she had a hand in this gift from nature as I drove home and watched it fade. Quite pleasing and smile inducing, still. We stood in that aisle and caught up for almost an hour, moving over for various other shoppers who were focused on their mission. It was so good to see her and such happenstance it gave me a nice boost. Neither of these little moments would have been noted if I hadn’t been looking up and around, aware of my surroundings. I’m so glad that I was.